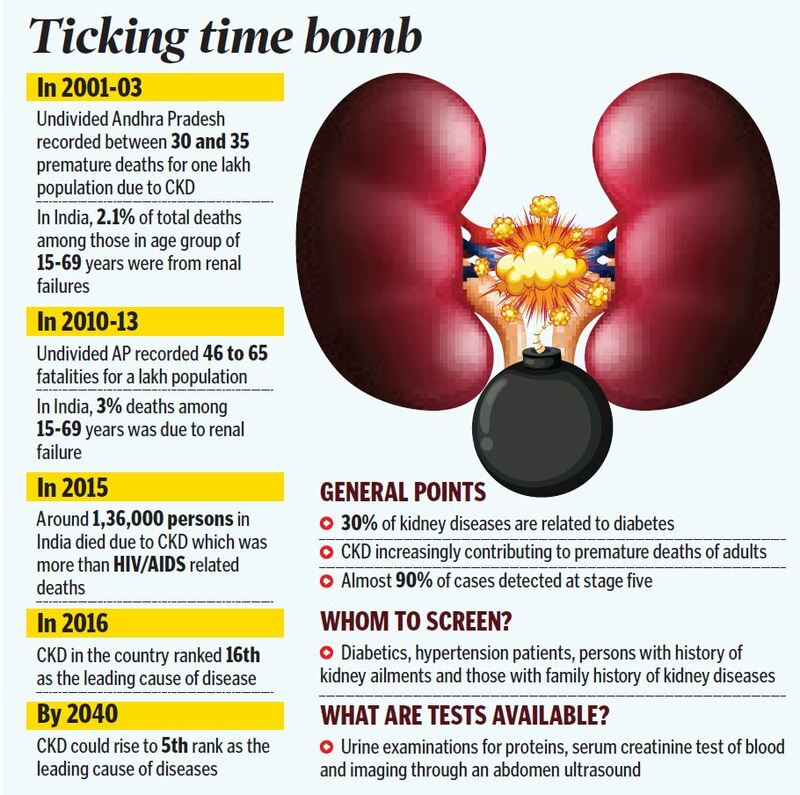 Hyderabad: In the next two decades, apart from heart ailments and brain strokes, the next major ailment that would potentially cause a lot of premature deaths among adults is Chronic Kidney Disease (CKD), a medical condition in which individuals gradually lose their kidney functionality. The rise of renal ailments in the last few years has been so steady that now we have reached a stage wherein the number of premature deaths of adults due to CKD is more than the fatalities related to HIV/AIDS in the country. 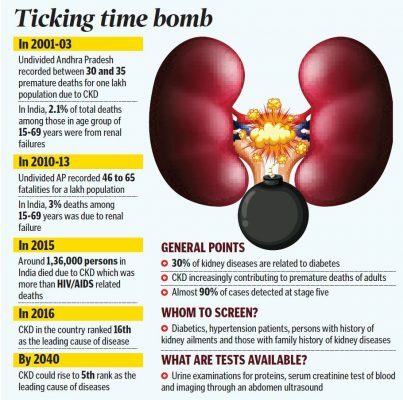 The Indian Council of Medical Research (ICMR) and Public Health Foundation of India (PHFI) study on Global Burden of Diseases (GBD) published in The Lancet in December last, ranked CKD in 2016 as the 16th leading cause of ailment in the country and added that by 2040, renal failure could well be among top five ailments. 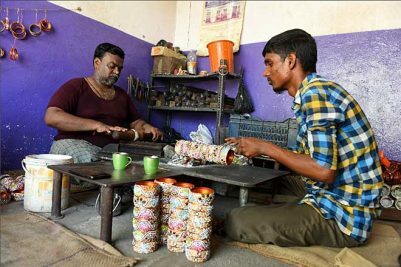 According to The Lancet study, close to 1.36 lakh persons in the country in 2015 had died prematurely as a result of renal failure, which incidentally also represents 3 per cent of all the premature adult mortality in the country. There are several other nationally representative mortality surveys that have shown that renal failure contributes substantially to adult premature death before 70 years of age and represents a growing cause of death. City nephrologists believe that the fight against CKD suffers due to late diagnosis. There are five stages of CKD out of which at present over 90 per cent of the patients with stage five kidney ailments, which is the last stage, are detected. Due to lack of any concerted effort on early diagnosis at either public or private health care institutions, by the time patients reach a tertiary care centre, the kidney ailment might have reached an advanced stage. There are numerous benefits for patients in early diagnosis of CKD including decrease in mortality rates. Timely diagnosis also means health care workers can prevent the progression of the condition among patients. Doctors said that 30 per cent of the CKDs are due to diabetes, which means early diagnosis could lead to better management of diabetes and hypertension. One of the most challenging aspects of kidney ailments is the lack of any kind of noticeable symptoms among persons who have stage one chronic kidney ailment. While there is a normal to mild loss of kidney function, quite often, the symptoms do not surface at all, which makes it difficult for doctors to identify and even patients to realise that they have an ailment. At stage two of the ailment, the symptoms and medical conditions gradually start to take root in the form of hypertension and protein in the urine. There is a mild to moderate loss of kidney functionality in the second stage, which can be prevented by medication at the right time. By the third stage, anaemia and early bone disease among patients sets in, which should be a sure shot indicator for doctors and patients to zero-in on the disease. This is the stage where there is a moderate to severe loss of kidney function among patients. Patients with stage four CKD start suffering multiple health complications including fatigue, swelling, nausea and vomiting. At this stage, the body suffers severe loss of kidney functionality and quickly the medical condition goes into the final stage when kidney fails, leading to either dialysis or kidney transplantation. Close to 30 per cent of the CKDs are due to diabetes, a vital factor for public health care experts to focus more on diabetics during the screenings. Apart from diabetics, people with hypertension, history of kidney ailments and family history of kidney ailments need to be screened and identified. Professor and Head (Unit-1), Department of Nephrology, Nizam’s Institute of Medical Sciences (NIMS), Dr Gangadhar Taduri points out that apart from early diagnosis, the role of physician in treating kidney patients is vital. The Harvard researcher from NIMS believes that physicians have a very important role in detection and follow-up of kidney ailment patients. Usually, physicians are the first who come across diseases that can lead to chronic kidney ailments among patients. Therefore, their role is very important in early detection of the ailment. Once they do so, it is possible to take preventive and follow-up strategies, which are important from the patient point of view. Who should be involved in patient care? Ideally, a trained primary care practitioner should be able to provide proper care to patients up to stage three of the kidney disease. Stage 3 is when the Glomerular Filtration Rate (GFR) usually falls down to 30 from above 90. Between stage I and III of CKD, the primary care practitioners should also be able to take help from other sub-specialist doctors. At later stages, the speciality nephrologists should ideally come into picture. The transition from primary care practitioner to a super-speciality care giver should always be smooth. Trained manpower continues to remain a challenge. Every year, rough estimates suggest that 1 lakh new cases of CKD are identified in India, which is a significant number. By our estimates, there are just 2,000 speciality nephrologists in the country and every year, only 200 more are added. There is a definite mismatch that needs to be addressed.